January 4, 2016 - New Jersey CPA magazine published an article titled "4980D Small Business Excise Tax Liability"
June 9, 2015 - Assemblyman Sam Fiocchi awarded Tony Novak a Joint Legislative Commendation for service to New Jersey marina businesses. More at MoneyIslandNews.com. October 29, 2014 - Tony Novak is cited in Money Magazine for contributing two tax planning ideas for empty nesters in this article by Karen Cheney. October 26-28, 2014 - A number of New Jersey publications including Star Ledger, Atlantic City Press, South Jersey Times and NJ.com published Tony Novak's editorial comments about the impact of Sandy two years after the storm. Novak volunteered for this media effort as a spokesperson and advocate of south Jersey businesses and the bayshore region. A compilation of the comments is posted on LinkedIn. August 7, 2014 - Wall Street Journal article titled "Small Firms Hit by Big Changes in Health Coverage" cites my health insurance advice for small business owners in this article by Angus Loten. 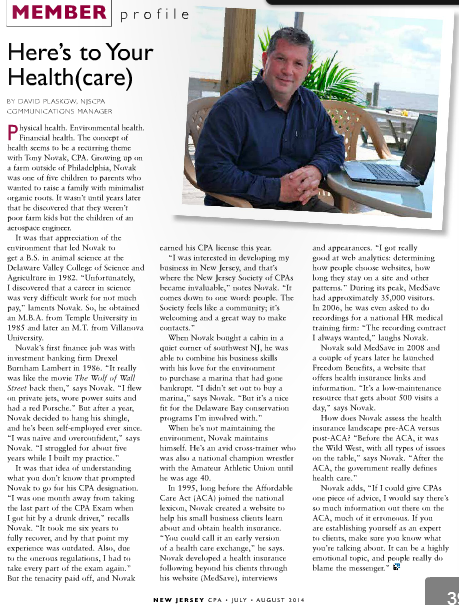 July 1, 2014 - Tony Novak is profiled in the July 2014 edition of New Jersey CPA Magazine in this article by David Plaskow. May 20, 2014 - PhDinspecialeducation.com's newly published "Online Handbook for Special Needs Parenting" includes a link and reference to Tony Novak's article "Financial Planning for Families with Special Needs Children"